Ремастеры бывают удачные и не очень. А джаз в этом смысле вообще тонкая материя. Этот альбом 1964-го года выпуска пересвел Фил Де Ланс в 1988-м году на Фэнтези Студио в Беркли. Скорее всего в конце 80-х ремастеринг был сделан цифровым способом, хотя, утверждать на 100 процентов нельзя. На мой взгляд, в данном случае на ремастере не очень удался саксофон Рэда Холлоувэя. А как у вас звучит? Благодарю, ildarrrr, за коллекцию шедевров. 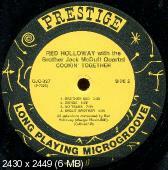 Attesting to the popularity of the Jack McDuff quartet is the fact that it has been impossible for this writer to contact the group's tenor saxophonist and leader on this date, Red Holloway. McDuff's group is constantly touring the country, playing in cafes and nightclubs throughout both the north and the south. The long tours in which the group participates often keeps them away from their homes for months on end. And on their long travels, they often do not get a days' rest, which is necessary for any artist. The personal hazzards of constant travel have been detailed elsewhere. What is often overlooked is the influence which the regime has on those, musicians whose lot it is to live and work in this way. I do not know for how long Red Holloway has been a participant in the endless whirl that is the musicians life, but the apparent fact of his place in entertainment is evident in the type of music he plays. Many people in countless cities have heard and enjoyed the McDuff quartet without ever asking themselves or the musicians who entertain them about the experiences that make up their lives. As with the music of John Coltrane or, for that matter, with any other musician who attracts public interest, Red Holloway projects, in his own way, the musical experience which is based on a particular personal experience. As far as satisfying that audience which pays for and attends their music, both Red Holloway and John Coltrane do their work well. Every musician, whether he is successful or has just begun to establish himself goes through the experience which both these musicians have had. It is a necessary part of any musicians’ development to go through a period of long road-trips before reaching the point where he can choose his work while allowing himself enough spare time to cultivate the often neglected portions of his character and interests. What is most remarkable regarding the jazz musicians’ progress is the inequality between merit and working conditions. For a concert musician, whether he were working for a major symphony orchestra or if he is a visiting artist such as Rubinstein or Stern, there is none of the personal and musical injustice which seems to plague the jazz musician. Whether he is on the job, trying to play to an obviously indifferent audience or trying to dress in a room no larger than a clothes closet, with six other of his fellow musicians—or if he is trying to organize his family and spare-time activity, there is always the onus of being just an entertainer; a barely human cipher whose only task is to amuse the public—and to fulfill that task for as long as that public remains interested. The music and the experience of which that music expresses is a voluminous example of frustration masked in carefree melodies whose charm lies in the fact that, often such music provides a lull in the lives of both the musician and listeners. The most talented composers have to undergo the most severe and rigorous difficulties. A study of the lives of Beethoven of Wagner would indicate that even their normal musical duties were often too difficult to handle. Yet we think nothing of the double onus which attaches itself to the jazz musician. 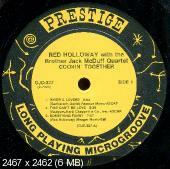 A musician such as Red Holloway is expected to entertain us with the results of his musical skill all the while he is attempting to keep his personal life in good order. The obvious aim of the music on this album is entertainment — you may hear the Jack McDuff quartet play this same music in any one of the many night clubs which they work in, at any time and under many circumstances. There is no attempt made here to do more than give the listener music which can be used for dancing or for a suitable background accompaniment for parties. In this area, the music accomplishes its stated purpose. 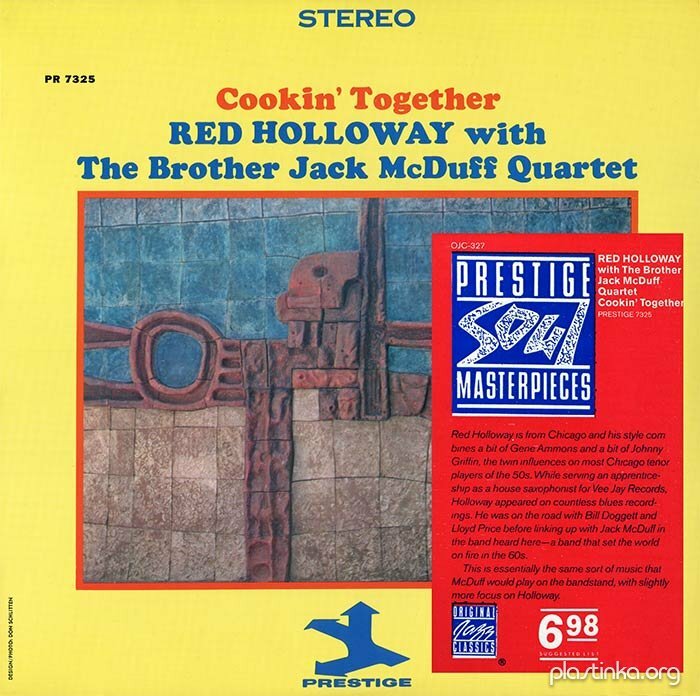 Red Holloway and Jack McDuff have had experience in this field of entertainment and have refined this talent to the point where their music is highly satisfying to those who have heard it in the past and it will go on being so. Bert Bachrach’s Wives And Lovers opens with Holloway waltzing through the movie theme in a deep-throated exhibition of melody. After Red has his say, Brother Jack plays an upper register solo which is quite melancholy. Guitarist George Benson then plays some choruses of his own with bassist Wilfred Middlebrooks supplying some apt background bass notes. This Can't Be Love marks McDuff’s debut in the recording studio as a pianist. The light touch which he uses on organ carries over to his piano. After Holloway rips through a brace of choruses, clicking off the changes with abandon, McDuff does his piano bit with Benson following close after with some thoughts of his own. McDuff goes back to the organ for Red’s, Something Funny, which is the first of the five blues. This twelve bar theme shows Holloway opening with short broken lines before swinging into a multi-noted display of prowess. Brother Red, which opens up the second side is strong on the after-beat. Frequent stop-time effects heighten the charging power. Denise is a light funky line which is stated in step-up, step down fashion before Red screams out some brittle lines, followed by liberal plates full of McDuff and Benson. No Tears, with McDuff heard again on piano is Holloway’s contribution to the Bossa Nova idiom. Both the melody and Holloway’s solo are strong in statement with no sacrifice being made to directness. McDuff counter-balances Holloways' solo with some romantic ambles into a realm closer to the Brazilian idea of the form. The album closes with everyone hollering on Holloway's, Shout Brother which shows that both Jack and his Brother Red really do shout. With Brothers’ Benson, Dukes and Middlebrooks supplying their talents and with Red and Jack, out in front, what else could be done but Shout? Brother Jack McDuff как всегда хорош, как и качество записи. Повторюсь, абсолютно натуральное звучание, никакой обработки. Активней голосуем. ildarrrr, AAD - это считаются самые лучше CD. Т.к. на них по сути все аналоговое, кроме финальной стадии печати на болванку. Т.е. запись и сведение аналоговые, и только в финале это переводится в цифру для штамповки на сд. Плюс на таких дисках обычно не используют компрессию, т.е. динамический диапазон такой же, как на виниле.